You’re going to love this month’s challenge! Some of my favorite colors happening here!! I’m vacationing this week in sunny California (well, sunny that is after the fog burns off, as I’m in Central CA!) and these colors scream Santa Cruz boardwalk, so I brought my finished card along for a photo op here! Here the narwhal is overlooking Santa Cruz wharf and the freaking majestic Monterey Bay! 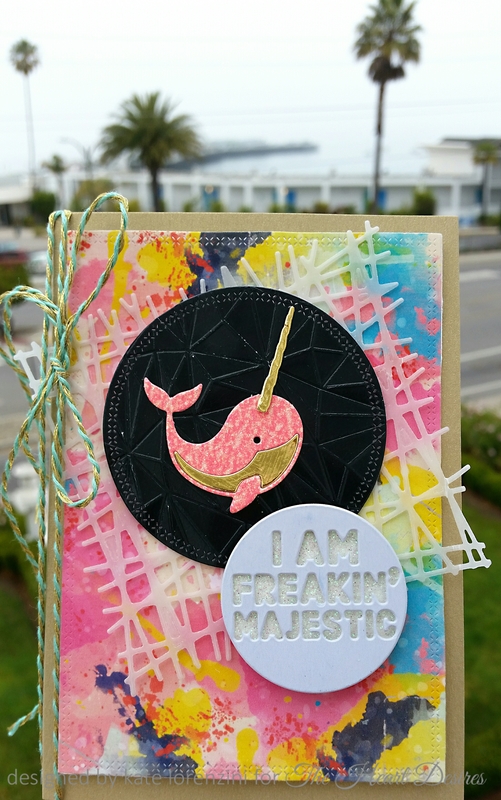 You can find the Neighborly Narwhal at the Heart Desires store, along with the Gina Marie cross-stitch circle/rectangle dies and WeRMemory Keepers Next Level embossing folder! Everything is layered on a gold cardstock base! Hope you’ll play along with us this month! 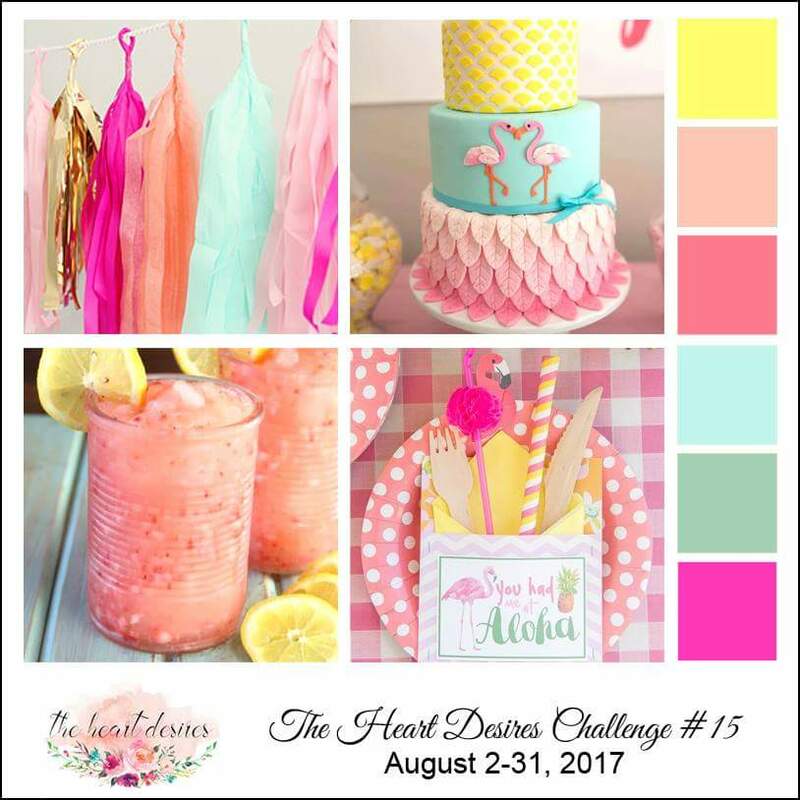 Hello Everyone and welcome to a special THD Challenge for July! 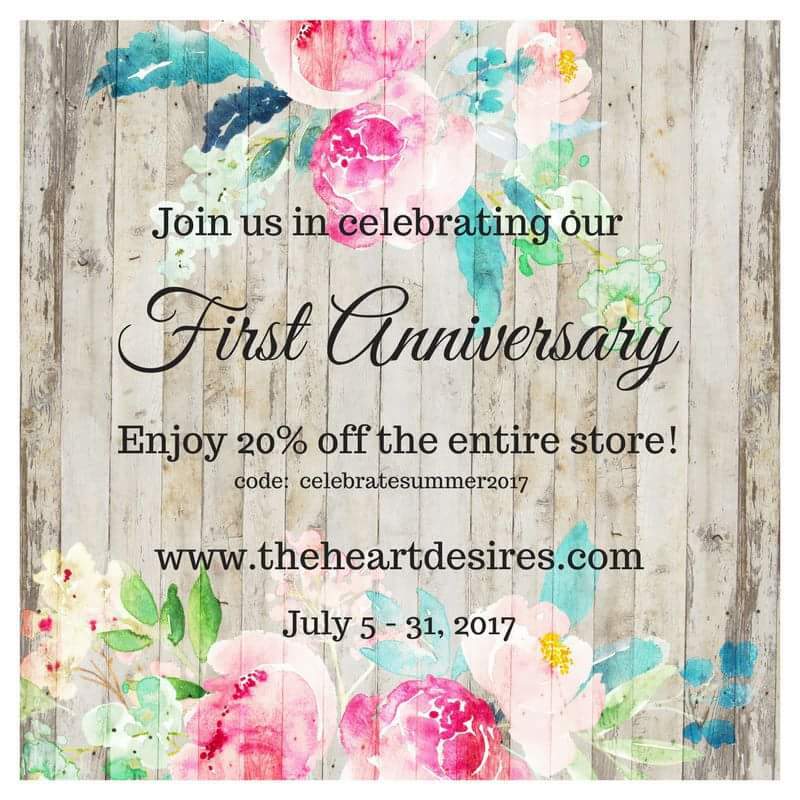 We just celebrated Toni’s birthday and the 4th of July, and now we’re celebrating the first anniversary of The Heart Desires Store with a sale and a new THD Challenge this month with a hop where you could be a winner! There are up to 3 opportunities to win a $20 gift certificate to the store. Leave a comment on the challenge post on the blog, on IG, and/or FB. You must be a follower of each platform you comment on for your vote to count. Enter the July challenge for an additional chance to win a $10 gift certificate. Don’t forget to link back to the challenge in your personal post. Winners will be randomly selected from the eligible entries and announced August 2 so you have plenty of time to comment and enter. NEW: A randomly selected participant each month will receive a $10 gift certificate to the store. Who doesn’t like an excuse to shop?! NEW: If you would like to be a guest designer on the blog, please add GD next to your name when you enter. Don’t worry. We’ll still be choosing our favorites and offering the opportunity for the winner to guest design for the challenge. Challenges will run from the first Wednesday to the last day of each month. Enter up to 3 times and combine with no more than 5 challenges, including ours. Include the challenge inspiration pic or link in your post. The challenge winner will be invited to be a future guest designer. When you post your entries, feel free to tag us on social media! Oh, and did we mention a sale? And now for how I was inspired by our challenge graphic! I pulled together some things old, some things new for this one! I had a few leftover Waffle Flower floral die cuts that had been colored with Brushos from my card in the April challenge. While I was playing around with them, I realized they could double as both fireworks and anemones! Here they are playing the role of the latter! I love how they look with the Memory Box underwater collage dies. The inner panel was cut from hand-colored alcohol inked glossy paper; the outer from the Gina Marie cross-stitch die. The top one is adhered with a cute clip from Michael’s mermaid line! The inner panel was colored with Distress inks and then sprayed with Heidi Swap Color Shine. I then stamped a sentiment from Waffle Flower’s Flora Cat Play. I put a clear dot from Tear Drops and Clear dots in the flower’s center. Finally, I added one of my sequin strands that uses a variety of sequins, including Hero Arts Ombre sequins and some anchor washi from Target on the inside! The base paper is from an old collection from Glitz Design. Thanks for celebrating with us! I look forward to seeing what you create this month! Click on any of the links below to purchase items used in my card for 20% off! Hey there little lambs, is April off to a good start? Either way, here’s something to put a spring in your step! 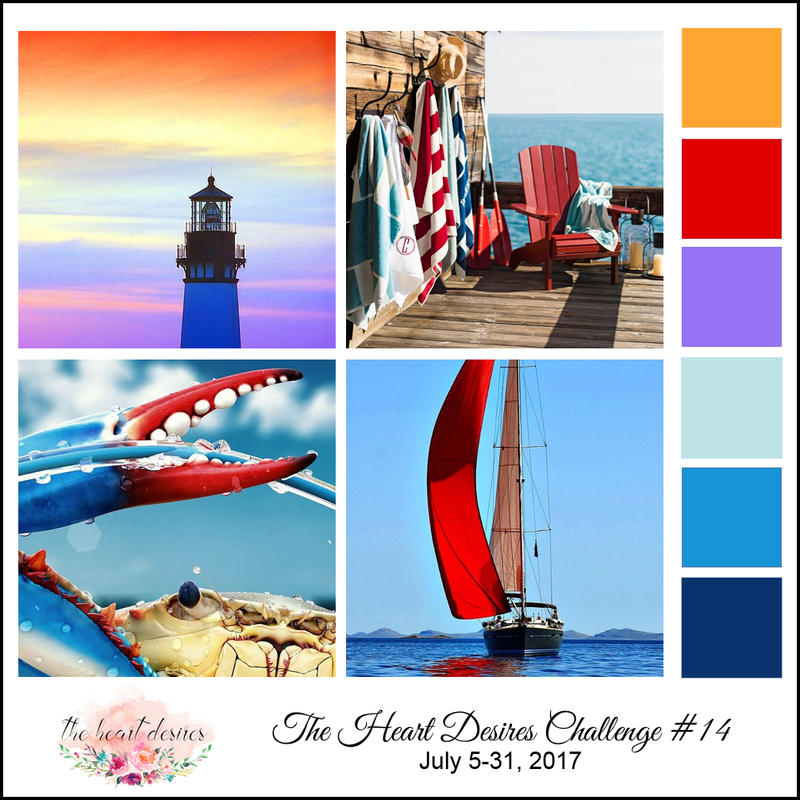 The Heart Desires Challenge #11! For my offering, I honed in on the chalkboard (possibly passe as far as trends go, but I really wanted some contrasting black with the pastels), and the florals. I didn’t have a lamb, so you’ll note I’ve substituted a hedgehog. Nothing says spring like a hedgie, right? Nearly all products used are available in The Heart Desires Store! My sentiment is deliberately mottled, imperfect and smudged, and that being said, it’s killing me! But you know, chalkboard! I achieved the smudged, off-set effect by stamping once in Unicorn White ink, then heat-embossing with Detail White powder. Once cool, I stamped again over it, just a bit off to the side, then rubbed the wet ink from the embossed letters. The little dancing white specks of embossing powder really goad me, but it’s hard to get a clean finish even after prepping with the Embossing Magic buddy. So this is how my card began; it is a tri-fold construction, created from just an 8.5×11″ piece of cardstock. I cut a diagonal and adhered the coverplate die (thanks Kimberly!). I wanted you to be able to see the patterned paper peeking through, thus the diagonal cut. The inside paper is from Maggie Holmes’ Bloom collection, available in the THD store. After getting those pieces adhered, I assembled my centerpiece. The chalkboard is cut from Gina Marie Cross-stitched rectangle die. The amazing new collection from Waffle Flower Crafts includes this Floral Border Die, which was cut from Ranger Watercolor paper and then colored with Brushos (Emerald and Marine Blue) and Distress Inks. Here’s a bit of a close-up of the coloring. And that HEDGEHOG!! Love that little guy. He fits perfectly in the scene. Tonya has many dies from Gina Marie, not to be found many other places, and I couldn’t resist this little critter. The inside is finished with some washi, of course! Finally, I bound the card together with my favorite wax string. Okay, hop to it and submit your creations by 4/30! I can’t wait to see how you are inspired! Happy Spring and happy creativity! Guest Designer: Ellen Hutson March Pinsights Challenge! Hello friends and welcome to the March Pinsights Challenge hosted by Ellen Hutson over at The Classroom! So excited to be one of the featured designers for the always inspiring challenge, particularly this month! Are you feeling lucky? Perhaps, the inspiration graphic will help! 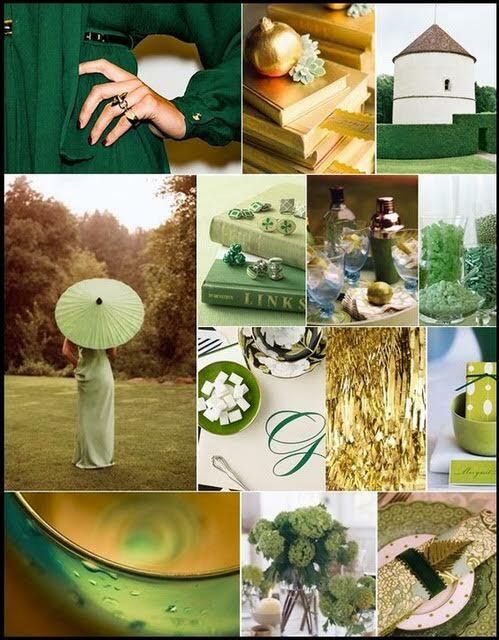 All things green and gilded! 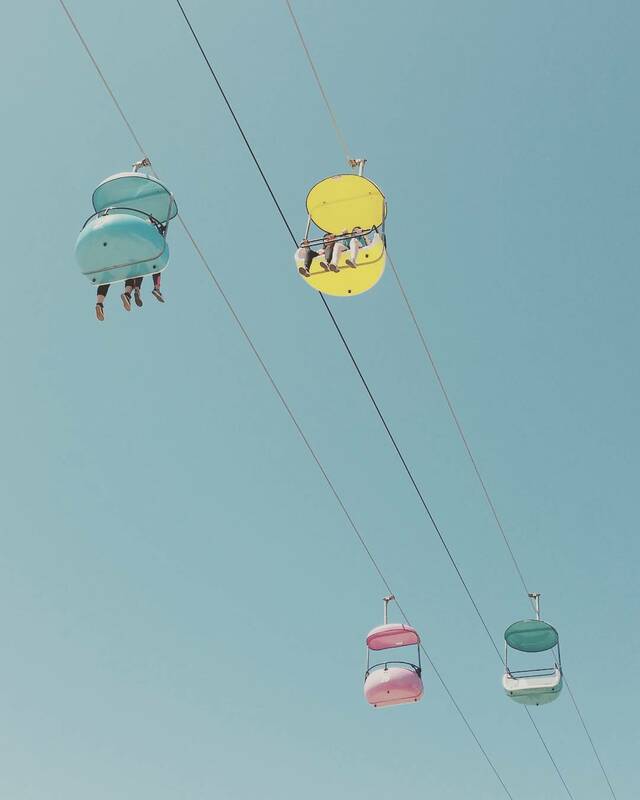 The images and hues are just so lovely, there must be a pot of gold awaiting somewhere, right? Only if you play along! You could be the lucky winner of a $50 gift certificate from Ellen Hutson! A random challenge participant will chosen to receive her pot of gold. But to be eligible, you MUST use Essentials by Ellen products and the photo badge as inspiration. You can find the Inlinkz in the challenge post over at The Classroom! Here’s my take on the challenge! If you follow my work on Instagram, you may know about my love affair with this diagonal window die! I had no idea prior to ordering it how much fun it would be. For my card, I have united quite a few stamp sets and products to create a unique focal point on the front of the diagonal window. First off, the clovers– they were created from hearts in the Love You So set, stems from Altenew’s Striped Florals set, dots from Bokeh Dots set, and a little gilded spray from Concord and 9th’s Brushed Blossoms set! The leaves/stem were stamped in Ranger Pigment Black Tie ink, heat embossed with Ranger Superfine clear powder, and then stamped over with the bokeh dots in Hero Arts Green Hills dye ink. They were embellished with some gold Ranger Stickles. Below you can see the sheen of the embossed stems/leaves, and the gilded leaves and spray. The 100# Linen Cardstock from Ellen is probably my favorite paper to use as a card base, and it is lovely as a textured stamping surface. It’s heft creates a substantial and luxe card. Using a variety of sequins from Pretty Pink Posh and Ellen Hutson and black wax twine, I created my signature sequin strands. I love that the gold leaf was included in the PPP Woodlands mix— a complete coincidence that it matched the stems’ leaves perfectly! Inside, I created a shaker card using an acetate window, more sequins, and some gold glass glitter! Shake it away to reveal the message, a sentiment from Up the Happy that underwent some stamp surgery to fit my purpose! It was stamped on the folded card base in Ranger Black Tie Pigment Ink; I added the sequin/glitter mix, and then adhered the acetate. Finally, I adhered the diagonal window layer! Once the outside was complete, I ran a strip of the new Little B Paper Tape in Jade along the bottom edge of the inner card! It is the perfect green! You have until March 28th to play along! Here’s hoping the luck of the Irish will rub off on you this week! Happy St. Patrick’s Day and happy creating! Hey Everyone! It’s that time of the month again over at The Heart Desires and I am so excited to bring you some cards to brighten your February! Using Altenew’s Wild Hibiscus and Concord & 9th’s Crazy Awesome sets, I created my first card. The flowers and bird were stamped on vellum in Unicorn white, heat embossed and fussy cut. I have layered the focal point on Maggie Holmes’ Bloom and Gather papers. For my red card, I am featuring Studio Calico’s scissors die— which isn’t easy to find, but Tonya has it for sale in the store! Cut from foam and layered with pattern paper. The flowers below are from the Crazy Awesome set, created the same way as those on the other card. Border papers are from Maggie Holmes’ Bloom collection. I hope you will get crazy creative with us this month over at The Heart Desires! Click to Shop and Be Inspired! All images and writing on this website, unless otherwise noted, are the original work and property of Kate Lorenzini/Pinned & Penned. Please do not copy or redistribute images or writing for commercial purposes or for submissions to card challenges. Kindly give credit if referencing or using the work as inspiration! Thank you!